It currently operates only two odds will soon be added to control up to three odds and the management of back-lay of exchanges (for example betfair). 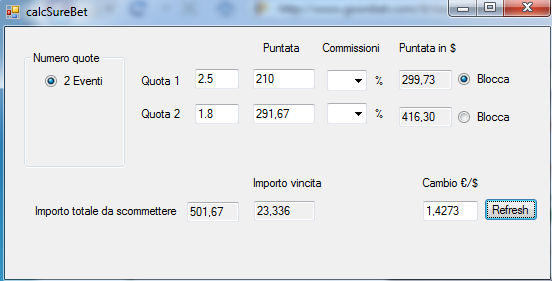 The application is made directly from bettingclosed for english versione from webpronostici for italian version. Write performance improvement, and tell us any bugs found directly in the comments that you find under the Download button. Instructions: csb does not require installation. License: The software is released under freeware license. You can redistribute the software provided it is at no cost excluding any initial charges for the cost of media. Is also prohibited any modification of software without the written permission of the author who retains all rights (copyright) software. @christian1981: the last betslip was published May 19, 2018, it is temporarily suspended but will resume daily with the World Cup. ]How Many Odds will you giving out Per-Day? 2 odds,3odds or 4 odds. Pls be specific. @shinasax: Once you have made the payment you will have automatic access to the VIP section, where you will find the VIP tips, you will also have access to the half time VIP predictions. Good day,when i be come a member how do u send the game to me?